The central and western parts of the region are relatively arid with two desert-regions. 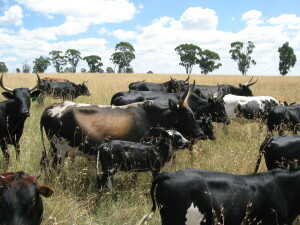 The eastern part of South Africa has a Mediterranean climate and is better suited to agriculture than the pastoralist-dominated west. It is debated as to whether herding and mixed farming developed independently, one before the other, or if they developed simultaneously. Deacon, H. J. (June, 1978). The Evidence for Herding at Boomplaas Cave in the Southern Cape, South Africa. 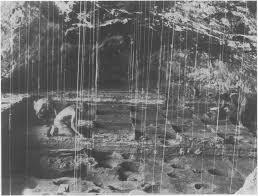 Boomplaas Cave functioned as a kraal, or an enclosure for animals, about 2000 years ago. The remains and calcified dung of domesticated sheep have been found at the site as well as pottery art which may indicate the domestication of oxen. The sheep remains are mostly those of juveniles which can be interpreted as a dependence on the sheep for subsistence. The lack of cattle remains found in the cave does not mean that cattle were not domesticated by the people who used the cave. In the area of Boomplaas Cave, it was typical for cattle to have been killed only for ritual or celebration and would have been kept closer to a settlement. This could possibly indicate that Boomplaas Cave functioned as an outlying stockyard used for the holding and processing of sheep as a source of food.